I love making handmade gifts, and I love supporting good causes. With this project, I am able to do both. Essentially, Elmer’s has challenged me to be creative and given me the opportunity to help the Boys & Girls Clubs of America. My challenge? Use an Elmer’s Tri-fold Display Board to make something. Anything. Then submit my project in their Projects For Great Futures contest. Elmer’s will select finalists based on originality and creativity. Then on December 14 (my birthday, yay! ), the public will be able to vote for the finalists’ projects. But here’s the sweet part: The Boys & Girls Clubs of America will receive $1 for every single vote, up to $50,000. Moreover, the Club closest to the Walmart store at which the Elmer’s® TriFold Display Board used in the winning entry was purchased will receive a $5,000 Walmart gift card and $1,000 in Elmer’s products. How’s that for a reason to get involved! Want to make one too? Here’s the tutorial. You’ll need to cut out a hole where your puppets will show. The top of the rectangle should be about 8″ from the top of the display board and centered in the center panel. Because I’m horrible at measuring straight, I used a large shoe box to trace a rectangle onto my cutting board. It wound up being 22″ wide and 17″ high. Feel free to use that as your measurements, or use dimensions that work for you. 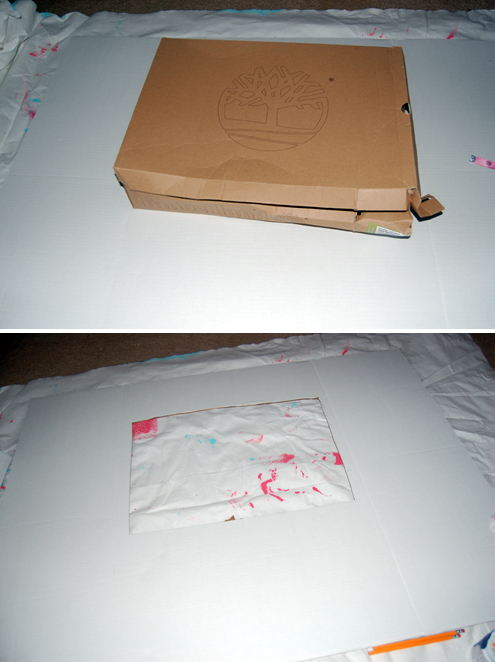 Use a box cutter to cut out the rectangle. 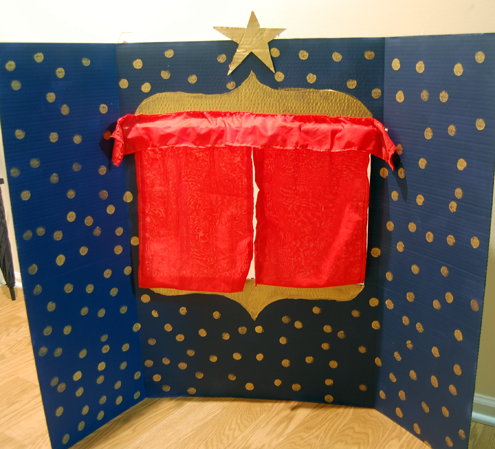 With your rectangle cut out, you’ll start to see that it’s looking more like a puppet theater. But it needs some pizazz. Paint the entire board in a solid color. I chose to use a paint sample that I had left over from when we painted our dining room. It was more than enough to cover the board. Because this is cardboard, you’ll want to roll on 2 very light coats. Otherwise, the board can start to warp and bend from the moisture. Let it dry for at least an hour. While this is drying, grab the piece of display board that you cut out from the center. Sketch a star on it. I did mine freehand, and it wasn’t exactly symmetrical, but it did the trick. 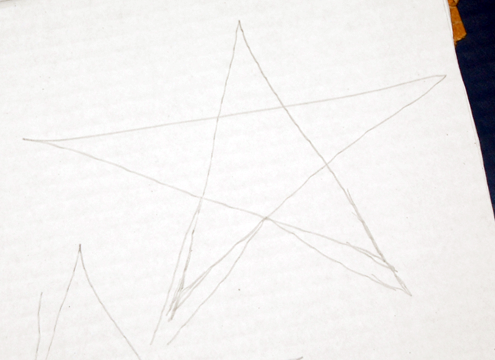 My star was about 6″ x 6″ at its widest and tallest points. Use the box cutter to cut out the star. 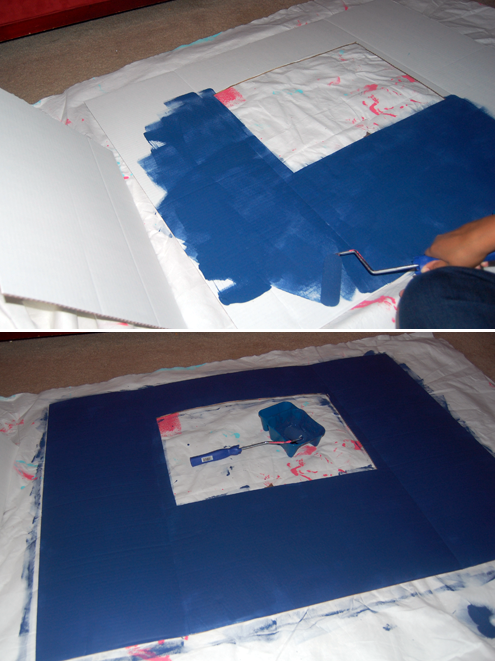 Paint the star in whatever color you’d like — preferably a color that contrasts with your background color. I used metallic gold craft paint. Set it aside to dry. 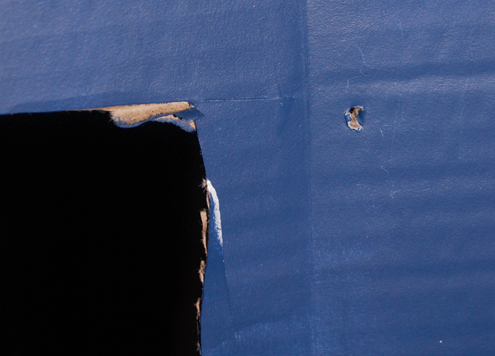 While the paint is drying, you can start making your curtains. 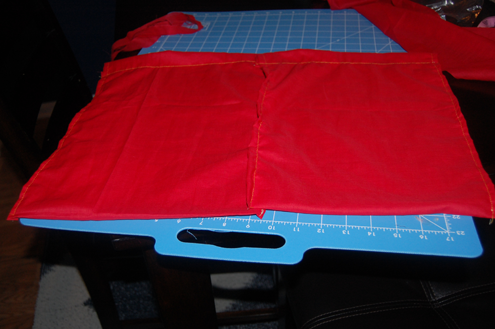 Cut out 1 piece of fabric that is 30″ x 5″. Cut out two pieces of fabric that are 13″ x 22″. The first piece will become your valance. Hem all four sides of the fabric with a 1/4″ seam allowance. There is no need to create a rod pocket, because this will be glued to the poster board. The other two pieces, however, will need a rod pocket. Pin and hem the 2 long sides of each piece of fabric and one short side with a 1/4″ seam allowance. I actually doubled my fabric because it was very thin, and I wanted to give it a little more weight. Because of this, I used the folded edge as a finished hem, so I didn’t sew it. I only had to sew the 2 longer sides. If you don’t have a folded edge, you’ll need to hem the third side. The fourth, unfinished edge will become the rod pocket. Fold the fabric about 1/4″ and iron the edge. Then fold again, this time allowing 2 inches. Hem all the way across the top, sewing 1 3/4″ from the edge of the fabric. 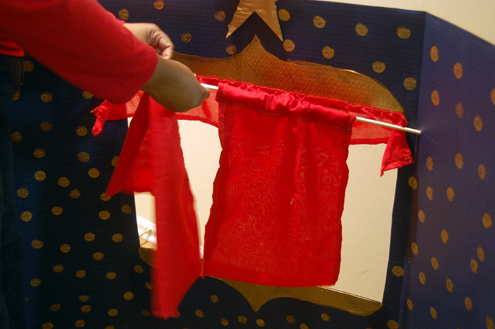 By doing this, you will be creating a pocket for the dowel, which will act as your curtain rod. By now, your display board should be dry. You’ll need to make holes for your dowel to fit through. I couldn’t find my hole puncher, so I used scissors. This part will be a lot easier if you use a punch. Plus, the hole will be cleaner. Make a mark on the right side panel about a half inch from the fold in the cardboard and parallel to the top of your rectangle cutout. Use your punch to make a hole. Do the same on the left side. Take your dowel and slide it through the holes from right to left to make sure it will fit. Remove the dowel, for now. Now it’s time to fancy it up! You can paint any decorations your want. Stripes, hearts, unicorns — whatever you want. I chose to paint a simple scallop at the top and bottom of the hole, framing it. 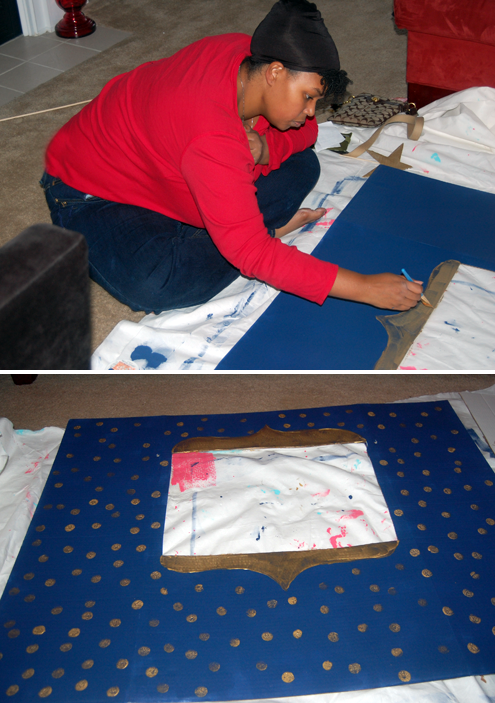 Next, I used a stencil sponge and made random polka dots all over the board, including the two side panels. Very simple, but it has an incredibly fancy effect. Paint to your heart’s content, and let it dry for at least an hour. In my experience, craft paint dries a lot faster than regular wall paint. 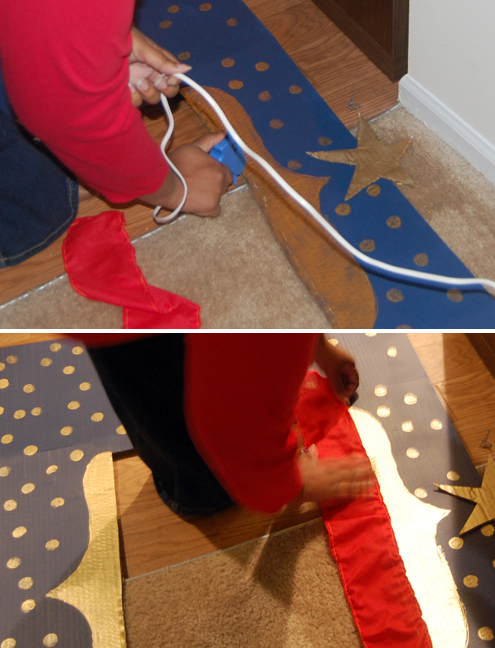 Hot glue your painted star to the top center of the display board. Next, you will hot glue your valance right above the curtain rod to hide it and give your curtains a fancier, more finished look. Measure a half inch to an inch above the top of the hole. Center the valance on the hole. You should have a little bit of a swag on either side. Simply hot glue the fabric to the poster board all the way across the top of the hole, leaving a little hanging on either side. Ta Da! You’re done. 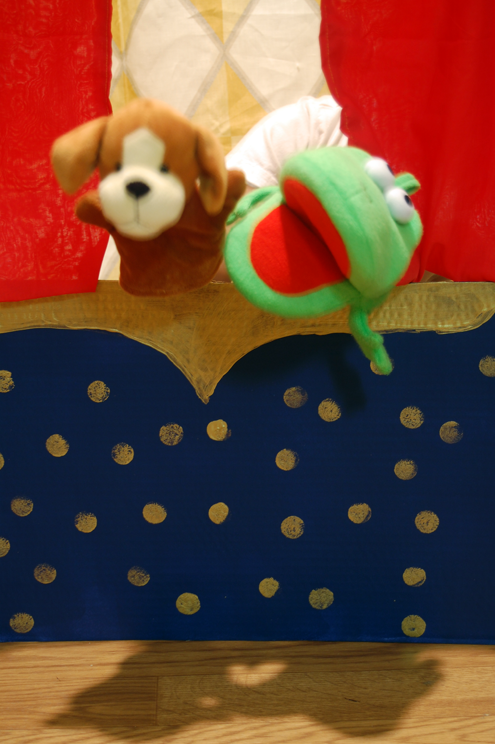 All you need now is some puppets and a willing participant! If you try this, I’d love to see how yours turns out 🙂 Plus, if you want to get involved in this initiative, it’s really easy! Simply use an Elmer’s Tri-fold Display Board to create a project for any reason (school, work, Christmas, or any reason at all). Once you are finished, submit it via email to ProjectsForGreatFutures@elmers.com. You could be chosen as a finalist! Disclosure: This project has been compensated as part of a social shopper insights study for Elmer’s #gluenglitter #collectivebias #CBias Collective Bias. All opinions, images and instructions are my own. Jennae, LOVE this! And what an inexpensive gift idea!! Adorable! My kids would have a lot of fun with one of these! what a fun project and a great gift idea!!! Jennae, this is wonderful! Wow, what a cool gift for a kid for Christmas. And good luck with the contest – can’t wait to see if you were selected! That is brilliant! I have a few smaller foam boards that I’m going to try and use. It would be cute to have a mini theater to bring along on trips and playdates. Thanks for the inspiration! I love it! Thanks for the detailed instructions, too. I think this will be our next rainy (snowy?) day project. Wow, maybe even I could make this. Love the curtains and other touches! Previous post: Food Saver Challenge: Did I Fail?